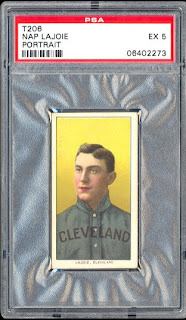 When ranking the top 15 baseball card sets of all-time, many factors were taken into consideration, such as: set design, rookie cards, number of hall of famers, historical significance, difficulty in completing, difficulty in completing in top condition, and overall value. Feel free to comment with any suggestions or disagreements. With the annual Hall of Fame Game now just a memory, the National Baseball Hall of Fame and Museum will inaugurate a new tradition next year: the Hall of Fame Classic Weekend to coincide with Father's Day and the beginning of summer. The Hall of Fame has teamed up with the Major League Baseball Players Alumni Association to create the Hall of Fame Classic, which will make its debut the Father's Day weekend of June 20-21 with an assortment of interactive activities at both the Museum and historic Doubleday Field in Cooperstown, N.Y. The Classic -- to be held Sunday, June 21 -- is an exhibition game featuring four Hall of Famers and more than 20 other retired Major League players. In addition, there will be a hitting contest and autograph sessions throughout the day with no extra cost for Hall of Fame Classic ticket holders. "We are extremely excited to start a new Cooperstown tradition for multi-generational families everywhere," Hall of Fame President Jeff Idelson said. "In tandem with the MLBPAA, we are thrilled to bring a marquee event to Doubleday Field, which promises to be a lot of fun and incredibly interactive. We know how much our visitors appreciate the human connectivity our events encompass." Doubleday Field, the site of the defunct annual Hall of Fame Game, has been made famous by scores of Major League stars and future Hall of Famers who played exhibition games there, the filming of scenes from A League Of Their Own in 1992 and recently as a concert venue for Bob Dylan, Willie Nelson, Paul Simon, The Beach Boys and others. Other events being planned are a game of catch at Doubleday Field for fathers and their children or grandfathers and their grandchildren, as well as a skills clinic for children, featuring former Major League players, and a number of events in the Museum in a salute to fathers. Ticket information and a complete schedule of events are forthcoming. "We're honored to be a part of this," said Hall of Famer Brooks Robinson, who is also the president of the Alumni Association. "There's a lot we can do to promote the game of baseball. This will be a great success and hit here in Cooperstown. It will be a lot of fun, autographs, family entertainment. That's what it's all about." "I think it's fantastic for the Museum and the Hall of Fame," Hall of Fame Chairman of the Board Jane Forbes Clark said. "It's really terrific for the community. This allows us to fill that gap with programming. I'm thrilled." 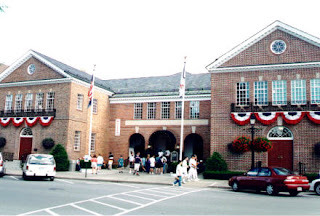 "We will couple The Classic with a number of other exciting family activities and programs throughout Classic Weekend, assuring that Cooperstown is the definitive Father's Day Weekend destination," Idelson added. "Classic Weekend will be engaging, educational and tremendous fun for community members, as well as baseball-loving families across the country. Given that Cooperstown is steeped in nostalgia, a legends-style baseball game is a natural fit." The cancellation of the 2008 Hall of Fame Game ended a tradition dating to 1940, when the Chicago Cubs beat the Boston Red Sox, 10-9, despite two home runs by Ted Williams. Scheduling problems in recent years resulted in the end of the series that was an annual pairing of Major League clubs in the traditional birthplace of the sport. When the Hall of Fame Museum officially opened June 12, 1939 -- an open date on the big league schedule -- an All-Star Game was played featuring two players from each big league club and managed by Hall inductees Honus Wagner and Eddie Collins. There were also exhibition games later that summer between the New York Yankees and the Triple-A Newark Bears, and between the Philadelphia Athletics and the Penn Athletic Club. At that year's Winter Meetings, the clubs agreed to arrange for teams to participate annually in an exhibition game in Cooperstown, starting in 1940. Through 1978, the game was scheduled the same Sunday as the Induction Ceremony. From 1979 through 2002, games were scheduled the Monday after the induction. This was the sixth consecutive season that the Hall of Fame Game was to be held on a separate weekend from the induction. What was supposed to be the last Hall of Fame Game in June, between the Cubs and San Diego Padres, was rained out. The last completed game was in 2007, when the Baltimore Orioles beat the Toronto Blue Jays, 13-7. Topps and CMG Worldwide (CMG) have reached an agreement that grants Topps the exclusive rights to produce the trading cards of arguably baseball's greatest legend, Babe Ruth. The deal includes exclusivity on trading cards - including game-used memorabilia cards and all other insert cards. "We are extremely excited to add baseball's greatest legend to the Topps brand," said Warren Friss Topps' GM of Sports & Entertainment. "As the ‘House that Ruth Built' celebrates its final season, we couldn't think of a better way to celebrate the legacy of Yankee Stadium than by giving our fans access to the most legendary player in its storied franchise." 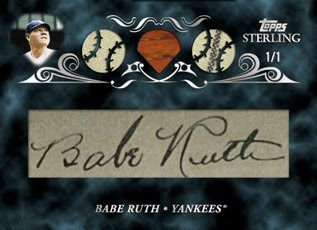 The exclusive Babe Ruth cards were unveiled recently with the release of 2008 Topps Allen & Ginter and will be found in the remainder of Topps' 2008 and 2009 baseball products. The products will feature an array of insert cards, autographed cards and game-used memorabilia cards. In April, Topps announced a deal with CMG that includes exclusivity on trading cards for 16 former baseball legends including Jackie Robinson, Walter Johnson, Ty Cobb, Tris Speaker, Thurman Munson, Roy Campanella, Rogers Hornsby, Lou Gehrig, Cy Young, Mel Ott, Johnny Mize, Jimmie Foxx, Honus Wagner, Pee Wee Reese, George Sisler and Christy Mathewson. Topps also holds the exclusive trading card rights to the Mickey Mantle Estate and autographed and game-used memorabilia card rights to young stars such as Ryan Howard and David Wright. 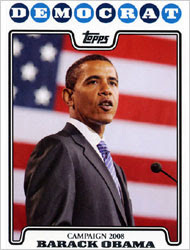 Topps announced Friday morning that it will document President-elect Barack Obama’s historic run for the White House in a 90-card set — the Barack Obama Inaugural Edition — in January. The set will document Obama’s life and will be available in stores nationwide before Inauguration Day. Each pack will contain six cards and one sticker at a suggested retail price of $1.99 per pack. Topps has produced many non-sports sets over the years, most notably including releases on President Kennedy and “Man on the Moon” cards in the 1960s, the Beatles in 1964 and Desert Storm sets in the early 1990s. Each card will tell a different story of Obama’s life through dozens of photos and words, many from his own speeches and writings.